Demolition workers felled the 50-year-old chapel at the turn of the century on the campus of my alma mater to make way for a new educational building (work crews built a larger chapel at a different location). 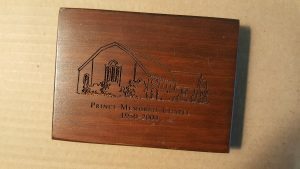 The crews carefully removed the oak flooring and cut each board into 3”-by-2.5” blocks, later stained and stamped with an engraving of the chapel and mailed to alumni and donors urged to help pay for the new building. Sitting and gazing at that block of wood that now decorates my bookcase provokes good memories of choirs, and weddings, and talented schoolmates. During my matriculation, students attended mandatory daily chapel services. The services, not always spiritual, introduced us to many guest speakers, several preachers who thought themselves entertainers, and several entertainers who thought themselves preachers in this venue. We heard faculty deliver non-academic talks about themselves as seekers and believers. We occasionally watched a short film or slide show and also listened to our eloquent dean of the college make weekly reports on administrative matters. I don’t remember much from his talks, but he taught me a word I’ve never forgotten: he always reminded us when services ended to “egress” through the appropriate exits of the building. I recall spending time alone in the building with its stained-glass windows, split chancel, and a table displaying an open Bible and a small golden cross. I didn’t visit the empty chapel for prayer or personal devotion, but rather to be in a quiet place for reading and reflecting in silence—a sanctuary—not something readily available on the bustling campus, not even in the library or a dormitory. Sometimes I listened while some student music major practiced on the electronic organ. We never spoke. The practicing musicians typically left when they finished through a side door just behind the organ bench; I walked to the rear of the sanctuary and egressed through the narthex (another word I learned in this building; though, most at that time referred to it as a lobby) to the main door. I did get to the point of leaving my copy of Martin Luther’s translation of the New Testament in one of the book racks of a front pew. I was studying German at the time and found this a quiet retreat, einer Zugfluchsort [refuge, shelter; a “flee-to spot”], or eines Heiligtum [sanctuary, shrine; that is, “a holy place”]. Its silence helped me grapple with the conjugations and cases of a foreign language that I’ve never fully mastered. I wrote inside the book’s cover, “Please do not remove from the chapel.” Gratifyingly, no one ever did for four years. And now a block of wood still transmits and upholds for me an experience of quiet and ease. In the past month, two writers I absorbed in my middle years and then set aside in my ensuing busyness presented theological and psychological wisdom I rediscovered in their works. The first, Frederick Buechner, is enjoying the twilight of a fruitful career, and his writings have slowly and significantly shaped my theological musings. While visiting with my sister- and brother-in-law in Philadelphia earlier this month I picked up a book on their dining room table and in about two minutes I was hooked. The Faces of Jesus (first published in 1974; reissued in 2005) became my latest guide to the mind of Buechner (and Jesus). Just a few days later, while browsing in the new books section of my local public library, the thrill of discovery overcame me again as I picked up Hallelujah Anyway: Rediscovering Mercy (published in 2017) by Anne LaMott. Candidly, I admit I haven’t kept up with Buechner and LaMott. I estimate I’ve read about a third of what they’ve produced. I’ve shied from Buechner’s fiction, but as a young adult, I devotedly read (and reread) his casual and careful theological musings. LaMott simply snared me with her early Bird by Bird (published in 1994), and I think my devotion had lagged by the time she published Stitchings (in 2013). But her often snarky single-Mom reflections have snared me again with sneaky spiritual insights in her rediscovery of mercy. I emailed thanks to my sister- and brother-in-law for their wisdom and mercy in leaving reading material around their kitchen and dining room. I confessed that I found Buechner’s reflections on the gospel through his deep looks into the face (i.e., faces) of Jesus to be among the most profound guides to reading the Bible I’ve encountered.